Two Iraqi prisoners have been killed by US troops during a disturbance at the Abu Ghraib prison in Baghdad, the US military says. 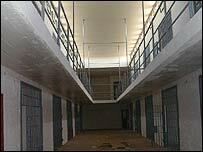 The trouble began when guards saw a large group of detainees attacking a fellow inmate, a statement said. "Lethal force" was used to bring the situation under control, it said. Abu Ghraib prison became notorious earlier this year when shocking pictures were published showing US soldiers abusing Iraqi inmates. It is not clear what sparked off the trouble which left five other detainees injured, the US military statement said, without specifying how they were wounded. The US military said guards had issued verbal warnings to stop the riot in which detainees were using stones and tent poles against the fellow inmate. However, the situation continued to escalate and the number of detainees involved swelled to over 200 "resulting in the use of non-lethal rounds to disperse the group". "When this failed to quell the situation and it was determined that a detainee's life was still at risk, lethal force was authorised, and the situation was brought under control." Seven US soldiers have been accused with the abuse of Iraqi prisoners. One has already been sentenced. "Over 200 detainees were involved in the disturbance at its height"